Why Is Tennis String Stiffness So Important To Power? Spin and String Stiffness. The optimization rules for spin appear to be "Goldilocks Principles": the stringbed must be not too soft and not too stiff, not too closed and not too open, and not too rough and not too smooth. You can have too much or too little of each. Spin and String Pattern. 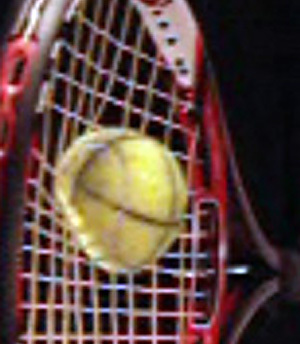 “Pattern” refers to the number of mains and crosses in the racquet. This affects the spacing between the strings, which affects stringbed stiffness, inter-string friction, and ball embedding. What impact do these factors have on spin production? What is stiffness? Essentially it is the ease with which you can stretch the string. Tennis strings are made of several materials and constructions. This means that as you stretch different strings of the same length, some will be easier than others to stretch. But they all share similar behaviors. A long string stretches more than a short one. A thick string is more difficult to stretch than a thin one of the same length. As you stretch a string further and further, it gets longer and thinner. It also increases its resistance to your attempts to stretch it more. Thus, it takes more and more effort to stretch it each little bit extra. In other words the string gets stiffer the more you stretch it. The harder you pull on it, the harder it pulls back. This mutual pulling is tension. 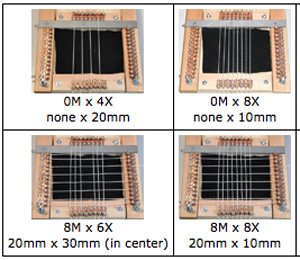 Some strings will build up to your desired tension after being stretched half an inch (a stiff string), while others may take two inches of stretch (a soft string). In other words, the tension increases more for every inch of stretch in a stiff string compared to a softer string. If the strings are pulled to the same tension, the stiff string stretches less. If they are pulled to the same length, the stiff strings climbs to a greater tension. But, as a player, what you want to know is how easy it is for the ball to stretch the strings, starting from the tension at which the racquet is strung. If you string your racquet at 60 pounds, how easy is it for the ball to stretch the strings above 60 pounds? The answer to that question has a major impact on power, comfort, and control. Here's what happens. Let's imagine a stationary racquet to make things easier. The ball approaches with a certain amount of energy of motion. We want to reverse the direction of that energy and send it back at the opponent. A force must be applied to the ball over a period of time in order to bring it to a stop and reverse its direction. This force is created as the ball and strings collide. The force pushes equally on the ball and the strings. It is small at first, but it increases the more the ball deforms and the strings stretch. This force begins to slow the ball. But the ball hasn't stopped yet. It still has energy, it keeps pushing, and the strings keep stretching, resisting more and more as they do so. The force keeps increasing, the tension keeps increasing, and the ball continues to slow. Finally, all the energy of the ball's motion has been transferred into elastic energy in the deformed ball and stretched strings, as well as being lost in heat, friction, and sound as a consequence of all of this activity. This stored energy is now available to send the ball back towards the opponent. There's less available energy now than what we started with, but still plenty to get the job done. These events are the same for both stiff and soft strings, with an important difference — the size and duration of the collision force are different in each case. Because the stiff string will not stretch as far, the force will not act as long. Thus, the force must be higher in order for the combination of force and duration of its action to be enough. The stiff string will create a large force for a short time and the soft one a smaller force for a longer time. Stiff strings may experience a peak force of almost 200 pounds whereas a soft string will be closer to 100 pounds. A stiff string may rise 100 pounds in tension and a very soft one only 20 pounds. The average force and tension during the entire impact duration will also be higher for the stiffer string. Both scenarios return the ball, but the consequences to the player and the ball will be different in each case. As for the player, being the recipient of a high force in a very short time is not pleasant. It is known as shock. That hurts. It is felt as an abrupt deceleration of the racquet, hand, and arm. It is like the difference between hitting your head against the wall or a pillow. The ball suffers also. With a stiffer string, the string stretches less and the ball deforms more. That means less energy flows into and is stored in the string and more ends up flowing into the ball. The problem is that the ball loses almost half the energy that goes into it. So more energy goes into the ball and more is lost. The returned ball thus has less energy and speed, and you receive more shock and get less power. Funny, the impact feels so big and the results look so small. I guess that is a double whammy — unless, of course you don't want power. In that case, you still get whammed, but if you survive you will have more control. That's because not only does the ball stay inside the baseline, but you will have greater directional control also. One reason is that the rebound is truer from an impact surface that does not deform. As Mr. Spock would say, "Fascinating." Depending on the stiffness of the two colliding surfaces, the force, tension, duration, feel, and results will all be different. It's up to you to decide whether it is good different or bad different.